I'm back, so you better get used to me! There are no Japanese Beetles in winter, and the June Bug grubs have burrowed beneath the frost line, so what's a starling to do? Be grumpy...and eat all of the sunflower seeds! ...another bit of beauty starlings add to the world is their incredible winged ballet. A huge night-time starling roost is about a mile from our house, so in the early evenings of winter, we get to witness this spectacle…swirls and turns, a giant black cloud that moves at incredible angles quickly and without pattern...it makes me stop and stare every time I see it. Click here for a video from England that shows an example of this incredible sight. ...a quick addition: Nate Swick just posted in Blog Birding #123 a link to a post on Cornell's Round Robin blog by Andrea Alfano detailing these murmurations. 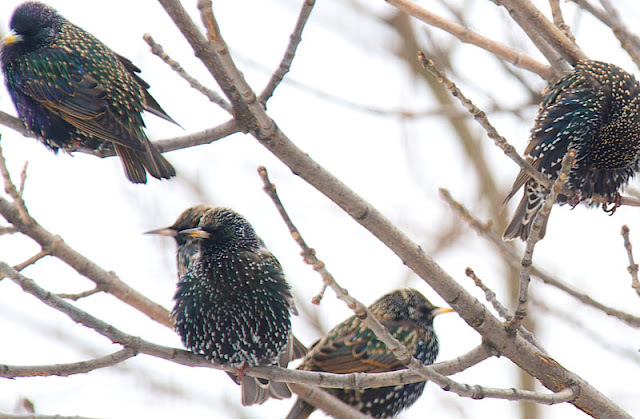 Click here for "How do Starling Flocks Create Those Mesmerizing Murmurations?" ...so while the ground remains frozen and covered with snow, we will probably always be a daytime roost for one of the flocks of starlings from our neighborhood night-time roost. I always try to remember that with the bad comes the good. We don't use pesticides on our lawn, so in the summer, starlings go to work for us. They are great at aerating the soil by digging up White Grubs (the larval stage of "June Bugs"), Sod Webworms, and other juicy invertebrates, which helps keep our lawn healthy. The US Department of Agriculture's Farmer's Bulletin (1928) No1571 reports, "The starling is one of the most effective bird enemies of terrestrial insect pests in this country. 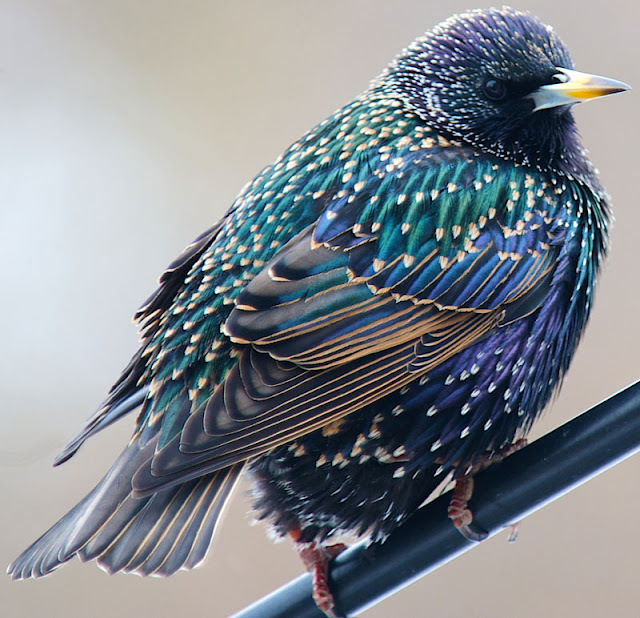 More than half (57 percent) of the annual food of the adult starling consists of animal matter, including insects, millipedes, spiders, mollusks, a few crustaceans, and bits of suet and carrion." 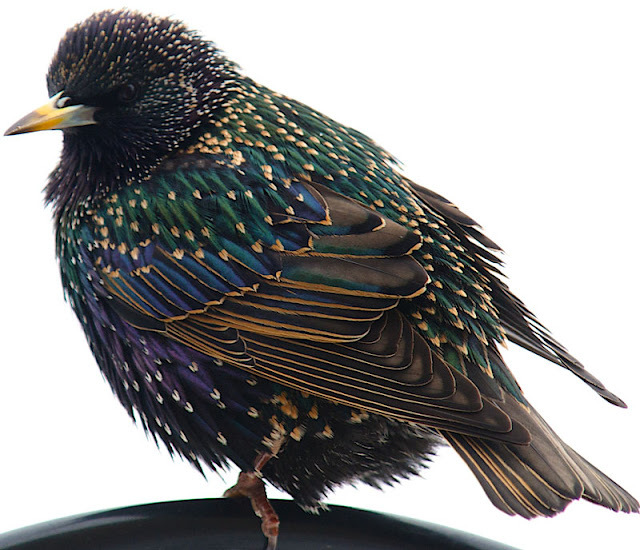 For more on the diet of the European Starling, click here. 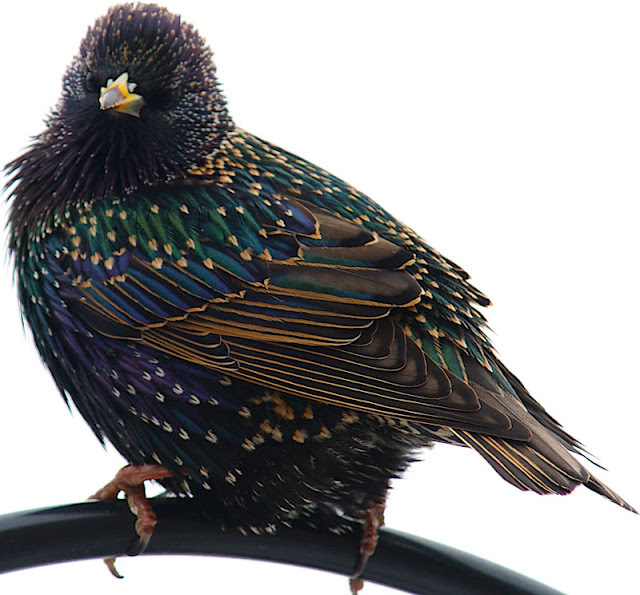 To learn more about night-time roosts and starling behavior, click here. Kelly, in your photos the plumage is so beautiful - it could rival peacocks! Great post! Great shots Kelly. They are beautiful. Like lots of birds, their reputation suffers from a bad attitude and over-saturation in some areas, plus they're introduced, but all in all they still have an aesthetic and ecosystemological (just made up that word) value. Your photos make them look beautiful but I still am glad they show up at my feeders in the country! Gorgeous photos of these sometimes pesky birds. Gorgeous shots up close and personal! Beautiful! 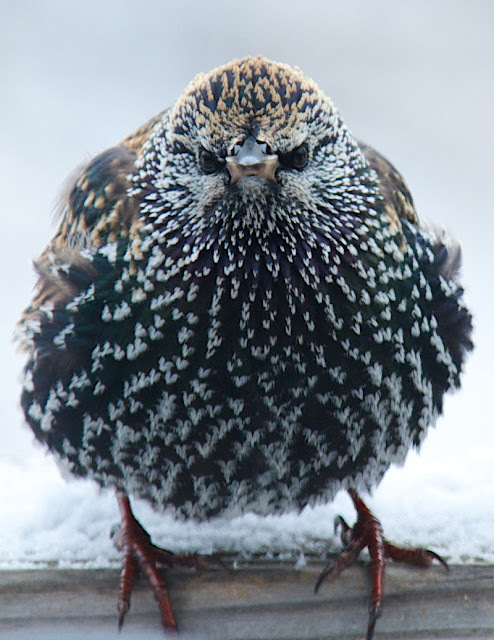 Your terrific photographs show off the starlings striking winter plumage so beautifully! The iridescent colors are lovely. 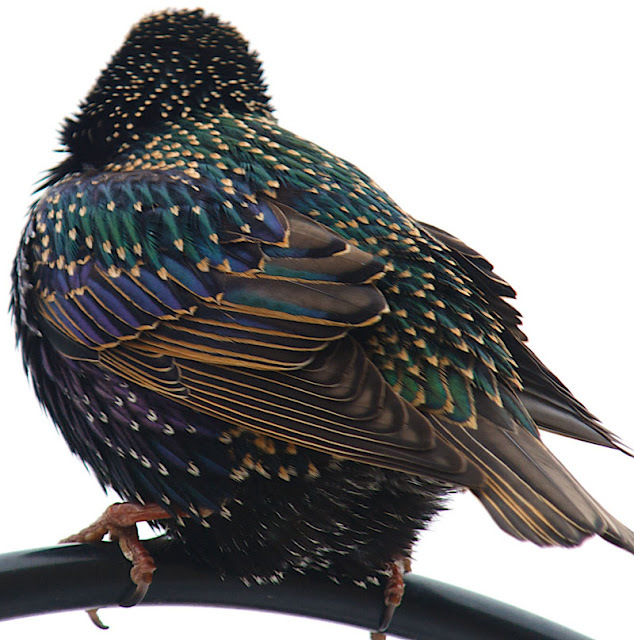 I learned a little something new today about starlings. Thank you. Wonderful post, Kelly!